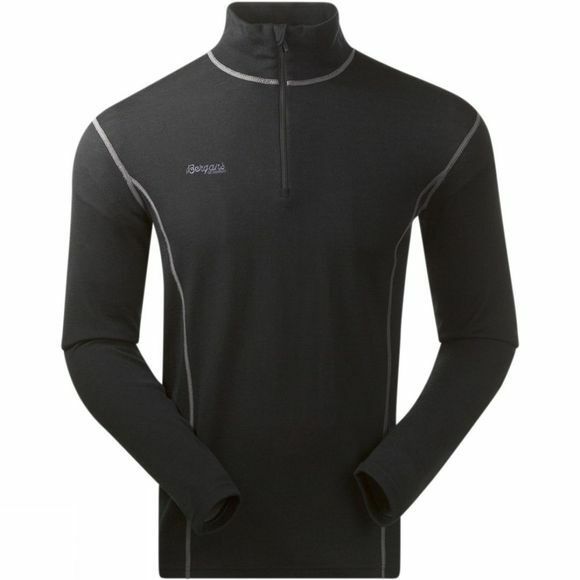 The Mens Akeleie Half Zip LS Top from Bergans is part of the hybrid series, a series of two-layer woolen base layer made from a combination of Merino wool and Polyester. The two-layer design allows the fabric to retain more air for enhanced insulation. The combination of wool and synthetic fibers makes the garments highly wicking and provides insulation under different temperature conditions and activity levels. The Akeleie range is also suitable for those who do not want to have wool right next to their skin. Akeleie can be used both as an innermost layer, right next to the skin, or as a midlayer on top of a thin garment in 100 % Merino wool by Bergans. Ideal for multilayering!